The release of the iPad three years ago has had a brutal impact on conventional PC sales, but new data on tablet use shows that Apple is not just fending off tablet competitors, it's advancing on them. Apple's iPads now account for 81.9 percent of U.S. and Canadian tablet web traffic, according to a report by online advertiser Chitika. That's the first increase the firm has reported since December. Last month, Chitika reported a slight monthly decline of half of one percentage point, from 81 percent to 80.5, in the iPad's web traffic share (shown below). Amazon's Kindle Fire, Samsung's Galaxy Tab, Google-branded Nexus tablets and the Microsoft Surface all reported slight increases from December through February, making Apple's February dip appear part of a trend toward a more competitive tablet market. 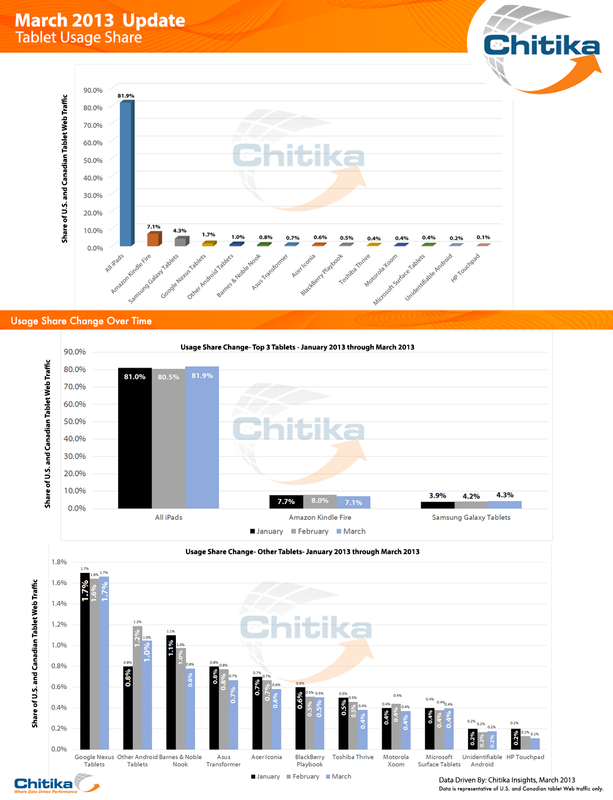 However, Apple's March increase of 1.4 percentage points reversed things, and now Chitika is reporting that tablet use by Amazon, Samsung, Google and Microsoft are all essentially flat or slightly lower. Apple increased its iPad lead by more than the Surface, Xoom, Nexus, Kindle Fire and all of Samsung's Galaxy tablets combined. Microsoft's beleaguered Surface is being used at the same rate as Motorola's failed Xoom. Together, the two share less than one percentage point. Are discounted iPad refurbs to blame? Chitika noted that iPad growth "may be partially due to Apple offering refurbished iPads at a discount beginning in mid-March, 2013," reinforcing the reality that Apple continues to sell its products at a price premium, giving it room to reduce prices to increase its share. Chitika's report is based on the network's 300 million ad impressions involving over 100,000 users visiting 250,000 websites. Because it measures the activity of real world users, it does not closely reflect the "shipment" reports compiled by market research firms who compare retail channel tablet inventory with Apple's iPad sales. Instead, it highlights which tablet devices are actually being used to access various websites, providing what appears to be a more accurate picture of the actual tablet market.